Sterling Silver Oval Cabochon Natural Ruby Pendant Necklace 2.50CT 16", 18"
GEMSTONE - RUBY. STONE WEIGHT - 1.30 CTS. PENDANT WEIGHT : 3.40 CARATS. QUANTITY - 1 PIECE PENDANT. STONE SHAPE - OVAL. STONE SIZE - 7x5 mm. Stone: Natural Corundum Ruby. (This Product is 100% Original Certified 925 Sterling Silver ). Quantity: 1 Piece. GEMSTONE - RUBY. PENDANT WEIGHT : 2.55 CARATS. QUANTITY - 1 PIECE PENDANT. STONE WEIGHT - 1.00 CTS. STONE SHAPE - OVAL. STONE SIZE - 7x5 mm. 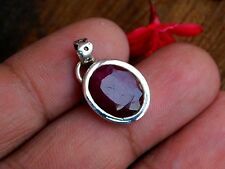 Stunning natural red cabochon Ruby silver pendant main stone about 9x11mm handcrafted unique design! Featured of Stones: 100% Natural Ruby. Style: Diamond Shape. Total Weight: 3.0 grams. Shape of Stones: Round. • Marquise 2.2x5/2.6x5.2mm:31Pieces. 14k Solid Gold Dangle Pendant with Natural Ruby. 14k Solid Gold (Stamped). 100% Natural Stones. • Round:3 mm:0.16CT. • Total :32 Pieces: 4.81CT. Must Be in Original Condition! 14k Solid Gold (Stamped). 100% Natural Stones. Be Aware of Must Be in Original Condition! Not Satisfy?. Marquise 2.2x4.2mm 32 Pieces. This beautiful pendant is set with a genuine 9.9X7mm 1.92 ct natural red ruby gemstone mined in Madagascar and a solid sterling silver casting. This nice ruby just glows in the sunlight; it is just truly gorgeous! 14K Yellow Gold 3.34ct Radiant Red Ruby Bezeled Solitaire Box Chain Necklace-18"
The necklace is featuring a 3.34 carat radiant cut (enhanced) natural red ruby gemstone--Amazing life and luster! Very secure clasp fastening. Hallmark: 14k. 14k Solid Yellow Gold Pendant with Natural Ruby. 14k Solid Gold (Stamped). 100% Natural Stones. Pear Cut 3.8x5mm:1Pieces0.27CT. Goldland Jewelry. Must Be in Original Condition! ( 30Total 3.75CT). Style: Rectangle Cluster. Featured of Stones: 100% Natural Ruby. Stone Information. RED RUBY & ORANGE SAPPHIRE OVAL CUT 3.75 CT. 925 SILVER NECKLACES LENGCH 18 Ins. OTHER : RED SAPPHIRE ROUND DIAMOND CUT 2.5 MM. SHAPE : OVAL CUT & ROUND DIAMOND CUT. FACE NECKLACES 54 X 27 MM. ROSE GOLD PLATED 925 SILVER RING. COLOR : RED & ORANGE. 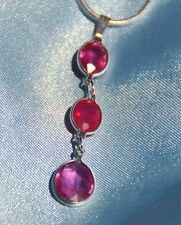 WEIGHT : WEIGHT OF SILVER 6.64 g. WEIGHT OF STONE 1.75 ct.
Pendant Material: Lab-created ruby(10mm). Silver Type: 925 Sterling Silver. Pendant Size: 30x11mm(1 3/16x7/16")w/bail. Pendant Weight: ~3grams(0.1oz). Featured of Stones: 100% Natural Ruby. Total Weight: 3.90 grams. Number of Stones: 18 pieces. Style: Flowers. Shape of Stones: Round. Solid 14K Yellow Gold 2.43ct Emerald Cut Red Ruby Solitaire Chain Necklace-16"
Very secure lobster clasp fastening. Hallmark: 14k. Featured of Stones: 100% Natural Ruby. Style: Three Flowers. Total Weight: 2.20 grams. Number of Stones: 21 pieces. Shape of Stones: Round. Style: pear shape. Shape of Stones: Pear n Marquise. Featured of Stones: 100% Natural Ruby. Number of Stones: 14 pieces. Featured of Stones: 100% Natural Ruby. Total Weight: 3.50 grams. Style: Round shape. Total Stones Weight: 3.40 Carat. Number of Stones: 34 pieces. Shape of Stones: Marquise. Style: Rectangle Cluster. Shape of Stones: Marquise. Stone Information. Ruby is a dark pink to deep red gemstone. Essentially it is a redsapphire. A BEAUTIFUL OVAL THREE STONE PENDANT -- TWO (2) 7mm x 5mm OVAL CUT STONES AND ONE (1) 10mmX8mm STONE. Ruby Jewellery. Considered one of the most precious and perfect gemstones, rubies are very popular in the jewellery industry including: pendants, rings, bracelets, earrings, brooches and tiaras. 14k Solid Gold (Stamped). 100% Natural Stones. Goldland Jewelry. Be Aware of Must Be in Original Condition! Not Satisfy?. ( 2.68CT 22Pieces Total). • 14k Solid White Gold Round Pendant with Natural Round Ruby & White Stone. • Round Ruby 20 Pieces. 14k Solid Gold (Stamped). Gemstone Information. 100% Natural Stones. Not Satisfy?. Must Be in Original Condition! 14k Solid Gold (Stamped). 100% Natural Stones. Goldland Jewelry. Be Aware of. 14k Solid Yellow Gold Cluster Pendant with Natural Ruby. Featured of Stones: Natural Ruby. Shape of Stones: Oval 5x3mm. Stone Information. 14k Solid Yellow Gold Flower Cluster Set with Natural Mix Stones. ( 14k stamped). Earring Closure: Stud ( See pictures ). Earrings -Pendant. Style: Flower Cluster Dangle. Shape/Size of Stones: Marquise and Round. Style: Cluster. Shape of Stones: Marquise n round. Stone Information. Ending Monday at 17:09 EDT20h 25mTop Rated SellerFrom IndiaMetal: Sterling SilverStyle: PendantLength: Less than 13"
Style: Cluster. Shape of Stones: Round 3.5mm. Total Weight: 2.63 grams. 14k Solid Gold (Stamped). 100% Natural Stones. Be Aware of Must Be in Original Condition! Not Satisfy?. (2.55CT)total. Joyaassilver Handmade Pendant Jewelry ANT-2066. -Joyaassilver Jewelry is Handmade Designer Jewelry. Joyaassilver Team. From United StatesStyle: PendantTheme: Love & HeartsLength: Less than 13"
14K Yellow Gold 3.38ct Radiant Cut Red Ruby Bezeled Solitaire Chain Necklace-16"
The necklace is featuring a 3.38 carat radiant cut (enhanced) natural red ruby gemstone--Amazing life and luster! Very secure lobster clasp fastening. Hallmark: 14k. 14k Yellow Gold 2.35ct Emerald Cut Red Ruby Bezeled Solitaire Box Necklace-18"
100% Natural Stones. 14kSolid Gold (Stamped). Goldland Jewelry. Be Aware of Must Be in Original Condition! Not Satisfy?. Pave Diamond Bangle. Pave Diamond Jewelry. Pave Diamond Bead Ball. Polki Diamond Bangle. Diamond Wedding Bangle. 925 Sterling Silver Jewelry. Wide Cuff Bangle. Rose Cut Diamond Bead. SPECTACULAR, 1.50CT T.W. GENUINE PEAR SHAPED RUBIES AND 0.70CT T.W. GENUINE DIAMONDS, 14K WHITE GOLD, TEAR DROP DESIGN NECKLACE. MADE IN ITALY. WE PROVIDE FREE RING RESIZING. Pave Diamond Bangle. Polki Diamond Bangle. Diamond Wedding Bangle. Pave Diamond Bead Ball. Rose Cut Diamond Bead. Wide Cuff Bangle. Handmade Gold Silver Jewelry. Natural Ruby Jewelry. 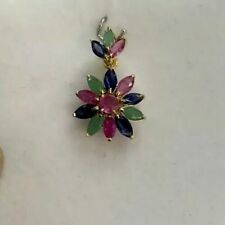 14k Solid Yellow Gold Flower Cluster Dangle Pendant with Natural Ruby. Featured of Stones: Natural Ruby. Stone Information. Pave Diamond Bangle. Pave Diamond Jewelry. Pave Diamond Bead Ball. Polki Diamond Bangle. Diamond Wedding Bangle. Rose Cut Diamond Bead. Wide Cuff Bangle. Handmade Gold Silver Jewelry. Silver and Ruby are clean. solid 925 sterling silver. 14mm pendant length including bail. HARDNESS 9 - DIAMOND IS 10. USA MADE JEWELRY. Simulated Man Made. any spots etc are in the photos only. identical to the natural in every way. 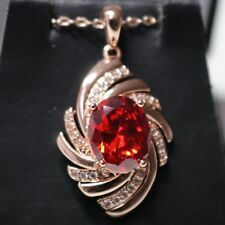 This Lovely Natural Ruby, White Zircon set in 925 Silver Pendant. 1 piece of Natural Ruby Cabochon 3.52cts are 8.4 x 10.8mm and 6 pieces of 2mm White Zircon in sides. Total carat weight of Gemstones 3.80cts. 14K Yellow Gold 3.07ct Radiant Cut Red Ruby Bezeled Solitaire Chain Necklace-16"
The necklace is featuring a 3.07 carat radiant cut (enhanced) natural red ruby gemstone--Amazing life and luster! Very secure lobster clasp fastening. Hallmark: 14k. Stone: Natural Corundum Ruby. (This Product is 100% Original Certified 925 Sterling Silver ). Ruby Gemstone Wt: 0.28 ct. We showcase a wide range of exquisite jewelry studded with diamonds & precious/semi-precious stone. We provide comprehensive solutions for Designer jewelry, Cast Fabricated jewelry and High end Handcrafted jewelry.